Bike Friday, co-founded by brothers Alan and Hanz Scholz in 1992, has found a niche market for those who want to bring their bicycles with them on their travels. BikeE began producing recumbents in 1993 and grew to become the world’s best-selling recumbent with their simple, economical designs. This bike is made entirely of aluminum, including the wheel spokes and the saddle! The Cat Cheetah was created by Rudi Kurth, a Swiss engineering prodigy. Rudi trained initially on the construction of lightweight panels for race cars and also built and raced motorcycle sidecars. 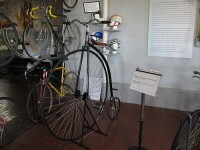 This Victoire model was made with lugged steel tubing and has been modified with a more upright handlebar. 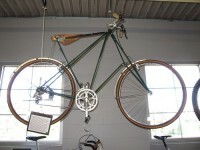 Greenstar Bikes began researching bamboo as a frame- building material in 2010. 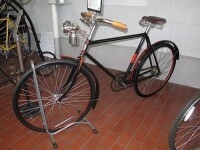 In response to the 1974 oil crisis, a small group of Swedish engineers obtained government funding to develop a bicycle completely composed of fiber-reinforced composite plastics (FRP).